You may not recognize his name, but he's credited with saving hundreds of millions of lives. Nobel peace prize winner Norman Borlaug died in Dallas Saturday night from complications of cancer. An agricultural scientist, he was known as the father of the "Green revolution." Going off to college. It's an exciting time for freshmen and their families. But it's costing a lot more these days. The average tuition at a four year college is up as much as $14-hundred over last year. That's forcing some families to change their choices. Fredricka Whitfield had the chance to follow one family through the process, all the way to move-in day. As President Obama was "talking up" his plan for health care reform. Tea party protesters were slamming it down as another example of government spending gone awry. Republican Senator Jim Demint of South Carolina is taking part in the tea party rally. Fredricka Whitfield asked him if there is any common ground in the health care debate that's becoming more polarizing by the day. An outburst that continues to reverberate across the country. Two words shouted out during President Obama's Wednesday night speech have many asking this question: How did we get to a point where it's o-kay to yell "you lie" at the President while he's speaking to congress? CNN's Fredricka Whitfield, Roland Martin and Republican strategist Phil Musser discuss the "You Lie!" aftermath. This week marks the first anniversary of the collapse of Lehman Brothers. So much has happened in that year that affects your wallet. At 10:30 this morning, we’re gathering CNN’s superstar money team for a panel discussion on what’s gone right the last year, what’s gone wrong, and what may happen next. As part of the segment, we’re going to have them answer your questions about the economy. Housing, 401(k)s, investing, the car industry, banking, unemployment – whatever you want to know about, just post your question below. We’ll pick some of them for the gang to answer on air. Serena Williams: Did She Cross the Line? 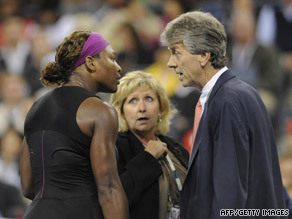 Tennis star Serena Williams' outburst at the U.S. Open: was it justified or out of line? We'll share some of them in the CNN Newsroom, 11am-1pm ET.